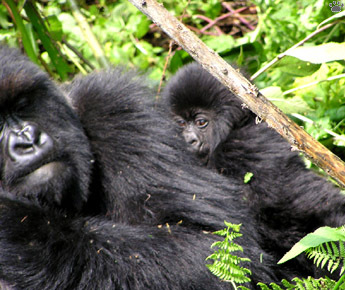 It is currently believed that there are two species and four subspecies of gorillas. 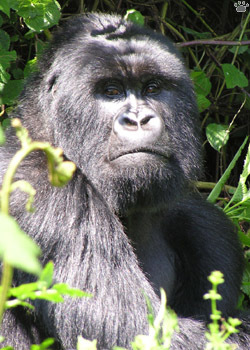 Silverback male, PNDV. Of them, mountain gorilla (Gorilla berengei berengei) is the largest (in fact, it is the largest living primate), and the most often seen by tourists - which is a bit ironic, because the area it inhabits was considered the mysterious and inaccessible heart of "The Dark Continent" up to a hundred years ago. 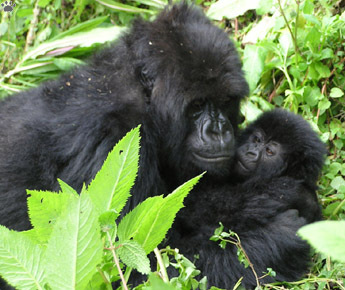 Mountain gorillas live in high-elevation forests of Virunga Volcanoes on the borders of Rwanda, Uganda and the Democratic Republic of Congo (Zaire), and in Bwindi-Impenetrable Forest of Uganda. 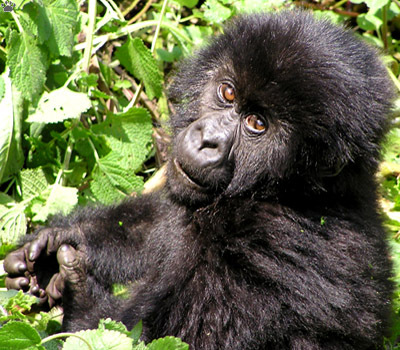 Bwindi gorillas have slightly shorter fur. 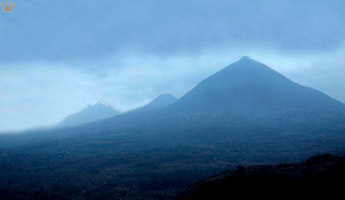 View of Virunga Volcanoes from Rwanda. 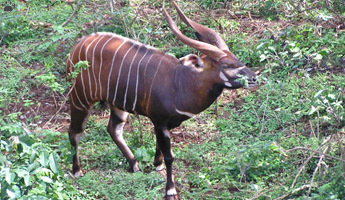 Bongo (Tragelaphus eurycerus), Bwindi-Impenetrable Nat'l Park, Uganda. 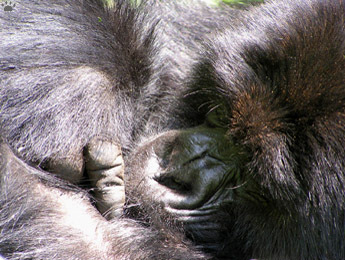 Female gorilla, PNDV. 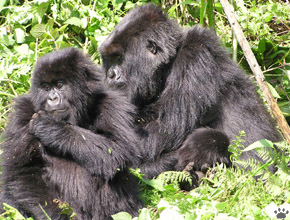 For unknown reasons, gorillas do not live in many areas of apparently suitable habitat, such as Nyiragongo area or the extensive Ruwensori Mountains nearby. 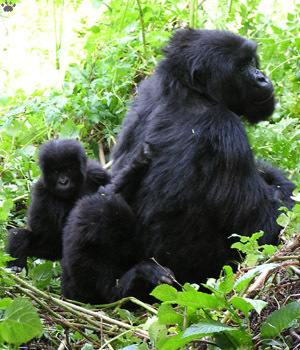 Female gorilla with a teenage daughter and a small baby, PNDV. 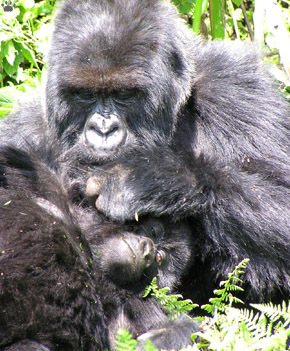 Gorilla with a little baby girl, PNDV. more well-behaved. PNDV. 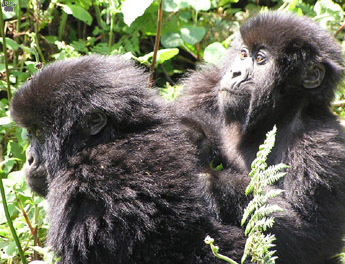 This subspecies is also the best-studied one, thanks to Diane Fossey's research in 1967-1985. 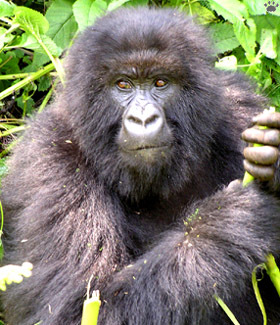 Her book Gorillas in the Mist is fascinating reading even for a non-naturalist. 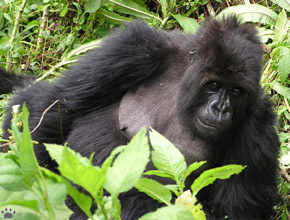 Diane was murdered in 1985, supposedly by poachers, but her campaign for gorilla conservation and the onset of mass tourism saved the subspecies. It is now well-protected as a major source of cash for Rwanda and Uganda; the numbers are slowly growing, with more than 700 recently counted. Apparently, nose grooves are as individual as fingerprints. PNDV. 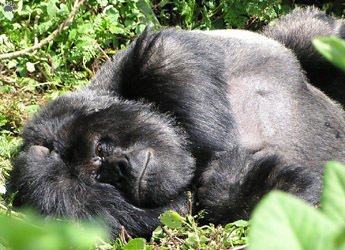 Glossy fur makes gorillas difficult to photograph in direct sunlight. PNDV. Napping in the sun, PNDV. 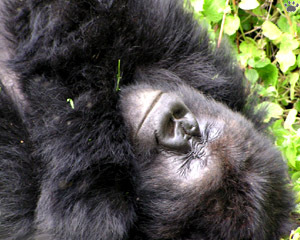 In July 2005 I had a chance to spend some time with mountain gorillas in Rwanda. It was a warm sunny day, rare in the Virungas. The gorillas were enjoying it. Beauty sleep after a second lunch, PNDV. 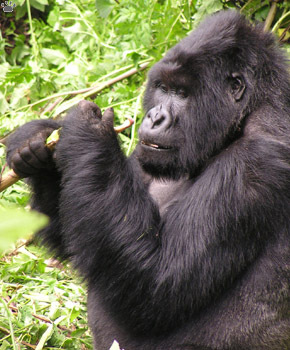 A silverback in charge of a group has a lot to think about. PNDV. 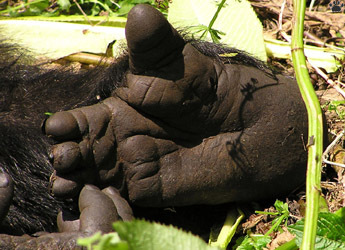 Gorilla feet are good for walking as well as for climbing. PNDV. "Come on, Mom, my hair is fine. Can I go already?" PNDV. 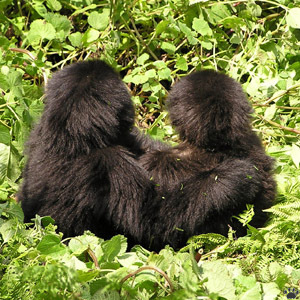 I was lucky to see Susa Group - the largest tribe of mountain gorillas, with 37-40 individuals of all ages, including two silverbacks and a lot of kids. 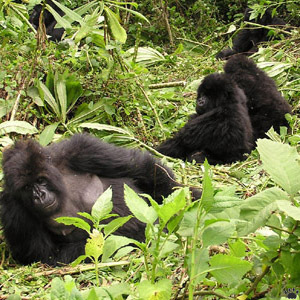 This is one of the groups studied by Diane Fossey. Seeing it sometimes involves an hour or two of climbing through beautiful mountain forest. 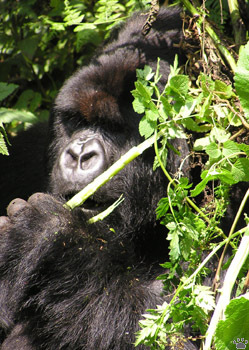 Gorillas feed on a variety of plants. Most don't taste good. PNDV. Nyabitondore with her twins, PNDV. 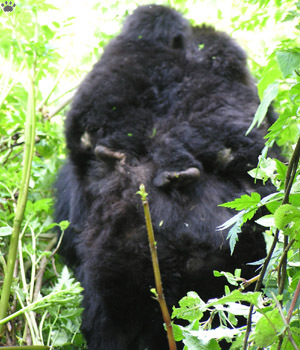 On May 19, 2004, one of females in Susa Group gave birth to twin boys - a very rare occurrence among gorillas (appr. one per 130-160 births). During my visit, the kids were at the most playful age, and watching them was a lot of fun. Twins riding on Nyabitondore's back, PNDV. 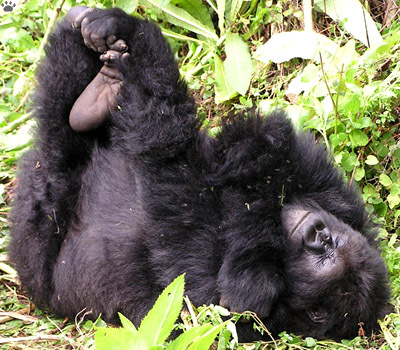 In gorilla schools, summer break is 365 days long. PNDV. Twins, PNDV. 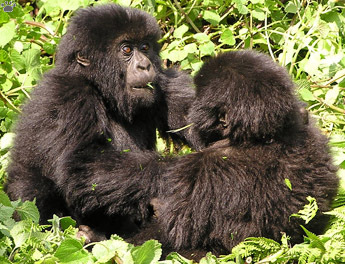 Susa group has been visited by people almost daily for more than 30 years, so now the gorillas are very tame. You are not supposed to touch them during a visit, but the twins haven't read the rules. "I wish I had a babysitter!" PNDV. 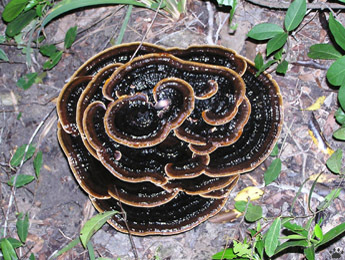 Trametes fungus growing on a piece of dead wood. PNDV. 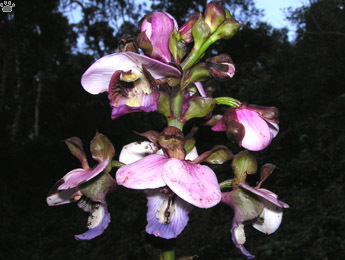 Giant orchid, Itombwe Mountains, DR Congo. 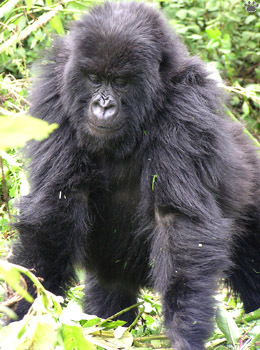 Mountain gorilla. PNDV. 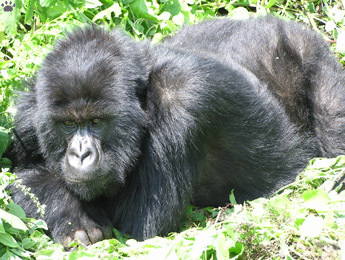 A few thousands of Eastern lowland gorillas (G. b. graueri) are scattered in the rainforests of a small area in DR Congo. They are supposedly very difficult to see, so I was surprised to encounter a young male within a ten minutes' walk from a tiny village in Itombwe Mountains near Lake Tanganyika. 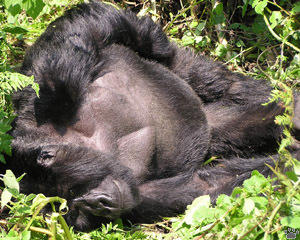 Eastern lowland gorilla, Itombwe Mountains. 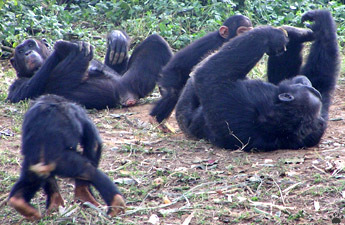 Chimps having fun, Semiliki Valley National Park, Uganda. 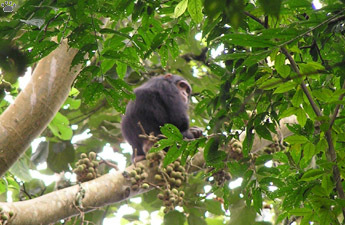 Chimp feeding in a fig tree, Kibale Forest National Park, Uganda. Female with a baby, Murchison Falls Nat'l Park, Uganda. 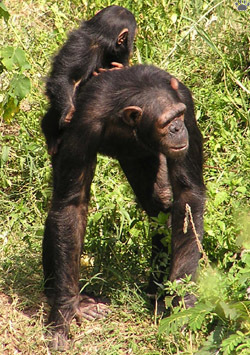 Eastern chimpanzee (Pan troglodytes schweinfurthi) is more common in the area. It can be seen in DR Congo and in all East African countries except Kenya. 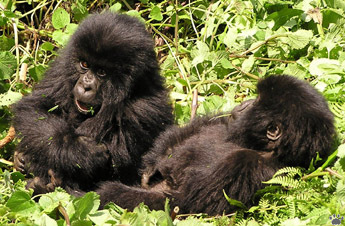 In Uganda, "chimp tracking" is now a tourism industry as big as "gorilla trekking". 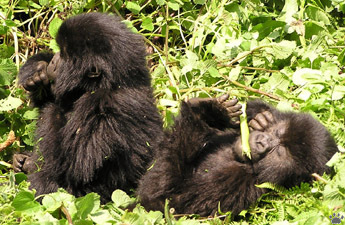 It is a good idea to see gorillas and chimps in one trip - just to appreciate what a diverse bunch our relatives are. 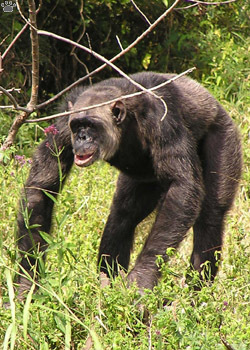 Chimps are much more arboreal and usually less approachable than gorillas. 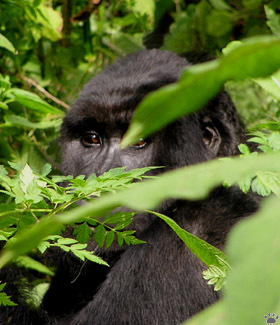 They are also more predatory and can be aggressive (there was even a man-eating chimp in Kibale Forest, Uganda). Grumpy old male, Murchison Falls. 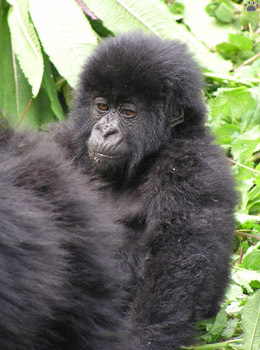 Young mountain gorilla, Parc Nacional Des Volcans, Rwanda.